a device used for the tamponade of bleeding esophageal varices, consisting of three tubes; one leading to a balloon that is inflated in the stomach, to retain the instrument in place and compress the vessels around the cardia; one leading to a long narrow balloon by which pressure is exerted against the wall of the esophagus; and the third attached to a suction apparatus for aspirating the contents of the stomach. Patient Care. Prior to insertion the tube is held under water to check for leaks. It is then chilled to make it more firm, and lubricated to facilitate passage. After the tube is in place, ice water may be circulated through the stomach balloon to help control hemorrhage. Mild traction is applied to the tubing at the point at which it enters the nose. Because of the danger of tissue erosion and necrosis of the gastric and esophageal mucosa, it is recommended that the tube be deflated for 5 minutes at 8 to 12 hour intervals. The tubing is removed in 24 hours if bleeding is controlled. The patient must be watched continuously for signs of either injury to or rupture of the esophagus, respiratory distress, and shock. It is possible that the tube may be pulled upward into the oropharyngeal area, causing acute respiratory distress and asphyxiation. A pair of scissors are kept readily at hand so that the tube may be cut in the event this occurs. Sengstaken-Blakemore tube. If bleeding site is in the esophagus, as from esophageal varices, the esophageal balloon is inflated. If bleeding site is in the stomach, the gastric balloon is inflated. Inflation creates pressure against bleeding vessels. a tube with three lumens, one for drainage of the stomach and two for inflation of attached gastric and esophageal balloons; used for emergency treatment of bleeding esophageal varices. a thick catheter having a triple lumen and two balloons, used to produce pressure by balloon tamponade to arrest hemorrhaging from esophageal varices. Attached to a tube, one balloon is inflated in the stomach and exerts pressure against the upper orifice. 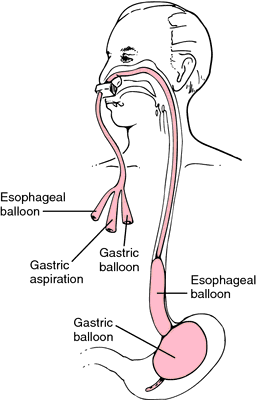 Similarly attached, another longer and narrower balloon exerts pressure on the walls of the esophagus. The third tube is used for withdrawing gastric contents. Emergency medicine A 3-lumen rubber tube used to quench bleeding in esophageal varices; central lumen allows communication of mouth with stomach; 2nd tube communicates with a rounded 'bladder' that is inflated to anchor the device in the upper stomach; 3rd tube communicates with a long inflatable balloon that places gentle pressure on the esophageal lumen, which usually stops the bleeding. See Esophageal varices. Cf Minnesota tube. Arthur H., U.S. surgeon, 1897-1970. Robert W., U.S. neurosurgeon, 1923–. Sengstaken-Blakemore tube - a tube with three lumens used for emergency treatment of bleeding esophageal varices.